My wife Smt. 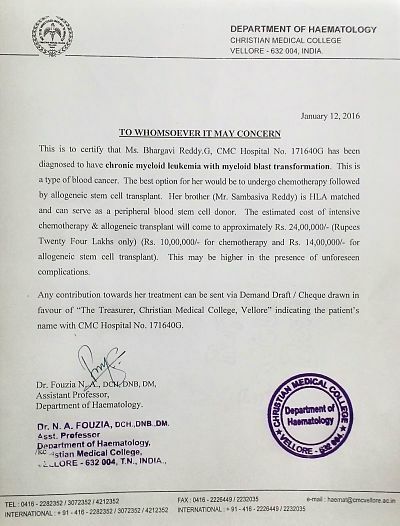 Bhargavi (29 years) is suffering fromChronic Myeloid Leukemia (CML) (Blood Cancer) since 2010. We have a baby girl of 18 months. Since 2010 she had given treatment at St. John's hospital at Bangalore. They tried their best by giving life saving tablets, but the condition has worsen from January, 2015. 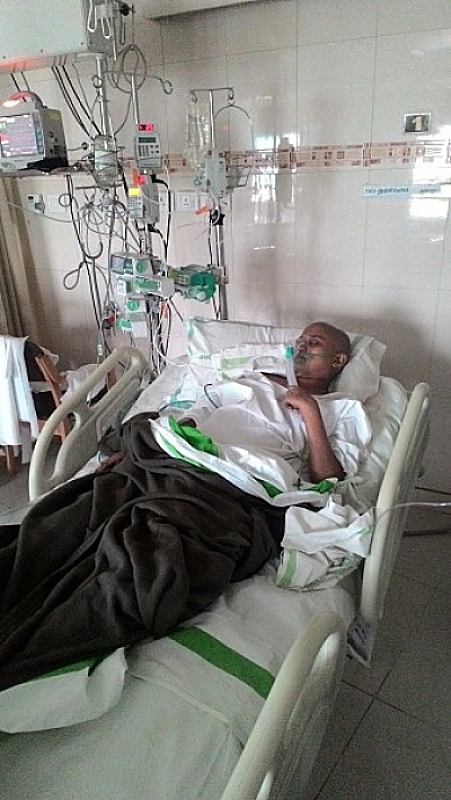 Doctors suggested to go for Stem Cell Transplantation which is the only option to save her life. Seeking their advice she was admitted in Narayana Hrudayalaya in Bangalore. She was given chemo and hospitalized for 34 days. The treatment costs to me Rs.8,00,000/-. As a private school teacher, I could not afford such a huge amount. I was helped by my friends with an amount of Rs.4,00,000/-. Since 5 years I could arrange and gather amount in debts and spent Rs.14,00,000/-. Present condition of her is serious with low Hb and BP due to improved cancer cells. She is admitted in CMC hospital, Vellore, Tamilnadu, India. She is admitted to undergo again chemo and Stem Cell Transplantation, which costs Rs.24,00,000/- without any complications. If any complications occurs the treatment cost will grow up. I have come prepared with Rs.5,00,000/-, I can't afford the total amount for transplantation. I want to save my wife and give my child to her mother. 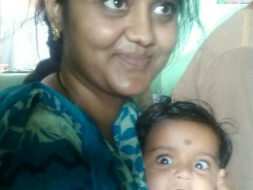 I humbly request you all to do the needful help and give life to her to live with her baby. I will be thankful to all, if you can help me by funding as your wish. We came together to support Bhargavi in her treatment. She was treated in various hospitals and received the best of all possible treatments including ayurvedic and herbal. However, with time her condition deteriorated and she developed complications. We are deeply saddened to inform you that she is no longer with us today. Bhargavi’s daughter Jeevana is now under the care of her father and grandparents. The family would like to thank all of the contributors for helping them give Bhargavi the best of treatment in times of extreme difficulty. Till September Bhargavi did very well regarding her health. But now again side effects starts like Hb levels decrease, WBC increase, Cancer cells increase etc. Dear friends, Pls pray the Lord to get speedy recovery and provide your kind support.